The new Spidi Sport Warrior Perf. 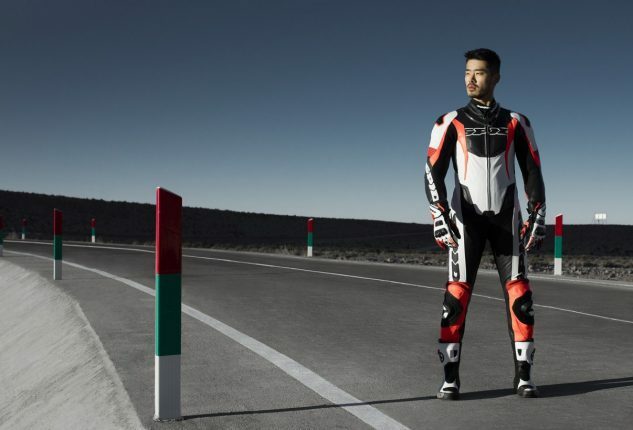 Pro race suit is a great option for track days or jaunts through the canyons. The SPIDI Sport Warrior Perforated Pro is a technologically advanced 21st century race suit developed specifically for superbikes of the modern age ? motorcycles that are far more powerful and significantly quicker than their forebears. Each Sport Warrior Perforated Pro is CE certified to the prEN 17092-2:2017 standard and has a main chassis of tough 1.1 to 1.3mm leather, with elastic high-tenacity nylon in flex areas ? offering extreme abrasion resistance. To keep you hydrated the suit has an arrangement for holding a Hydroback bag and straw, as well as vented leather sections and a removable mesh lining to keep you cool. A streamlined aerodynamic end-piece is fitted to the back to assist with aerodynamics, and the suit has adjustable and removable racing knee sliders. In order to ensure a comfortable fit with your boots, the lower pant leg of the suit is made from a soft, comfortable material that?ll help you avoid chaffing and discomfort. Inside the suit you?ll find a removable, washable mesh lining that helps keep you cool and dry ? particularly as the suit offers excellent airflow thanks to its perforated leather main chassis. Spidi offers the Sport Warrior Perforated Pro in three colorways to accommodate a variety of tastes, it?s offered in sizes ranging from 46 to 58, and replacement knee sliders are available both from Spidi directly and from any good local motorcycle apparel store. The post New Spidi Sport Warrior Perf. Pro Race Suit Released appeared first on Motorcycle.com News.